“OUT IN JAPAN” is a project aimed at shining the spotlight on sexual minorities in Japan — with various acclaimed photographers taking portraits of LGBT – identified individuals from all walks of life — with the goal of showcasing 10,000 portraits in the next five years. With the cooperation of individuals, organizations, corporations and local governments, the project is launching a website, an exhibition and a collection of photographs to familiarize the Japanese public with the presence of sexual minorities and to share accurate information and knowledge of the LGBT community. For sexual minorities, “coming out” is a step-by-step process, and timing and how it’s done is unique to each individual’s circumstances. There are many who decide not to come out. At “OUT IN JAPAN”, we work towards building an inclusive and accepting society that will support those who are willing to come out. “OUT IN JAPAN” has a goal of amassing 10,000 portraits in a gallery in the next five years. Alfa Romeo — who alongside the certified NPO good aging yells has been promoting the empowerment of Japan’s LGBT community since 2011 – is supporting the project through their crowdfunding platform “GREENFUNDING”. In order for this project to be sustainable to spread throughout Japan, please give us your support by visiting this crowdfunding site and sending us a donation. YOUR LIGHT BRINGS US PRIDE. Please support “OUT IN JAPAN” through crowdfunding. 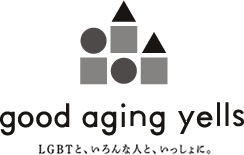 good aging yells’ main focus is to directly collaborate with corporations and NPO/NGOs to promote an LGBT-friendly “foundation-building” via activities ranging from workshops, symposiums and ongoing events, to cafes, shared homes and community spaces.A distinguishing feature of good aging yells is that its members work full-time jobs in a variety of fields and work pro bono for the organization. On October 1st, 2014, the group acquired an NPO certification from Tokyo Prefecture. The acronym “LGBT” stands for Lesbian, Gay, Bisexual, and Transgender. According to an LGBT census taken in 2015, 7.6% of the Japanese population identifies as LGBT. This means that if left-handed or blood type AB people amount to roughly 7% of the population, there is a strong probability that you know an LGBT person. Because of discrimination and prejudice against the LGBT community, there are few individuals who choose to “come out”, which makes them an invisible minority. In recent years, the United Nations and Western countries have been playing central roles in promoting the understanding and encouraging support of the LGBT community, which in turn is starting a worldwide movement.